That is a refreshing non biased reply, the part of my reply you highlighted was of course a result of what we all see over and over on this forum and that is bashing of a part and belittling of the user for reasons ranging from where it was made, to not being the brand name that is deemed the only one accepted here, makes some people scared to even ask questions at times. As you saw I was going back and forth gaining information from guys like myself and most members here just trying to get our cars running and driving in a economical ( if possible ) way, I know I would much rather walk into my jiffy parts than to mail order something. To go forward with that thinking in most cases the local parts stores that carry a corvette caliper will stock it, if not most towns will have a store that will stock it or at the very least have it the next day, and pretty darn sweet they offer lifetime replacement, when it leaks ( you say at some point they all leak ) rather than pack it up pay for shipping back a person can take it down to their local vendor and swap it out easy - o.
the idea of a forum is to learn the experiences of it's members and form an opinion from there.my experience with local caliper re builders was a nightmare.Lonestar all the way! This NAPA caliper (new) has been working fine for three years. It is not Delco and was new and the same price as rebuilt. Chinese? 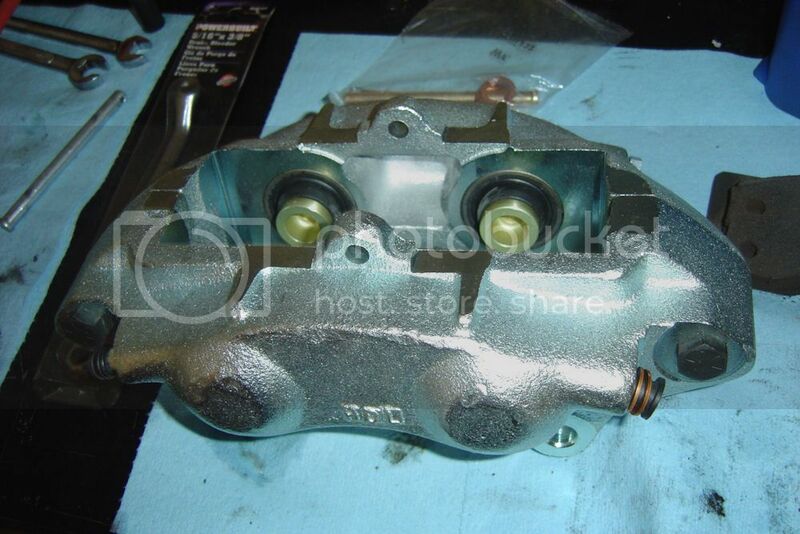 Last month I replaced a left front no name caliper on my nephews 75, it was on the car 25 years ago, when he bought it. I replaced it with an Advance Delco caliper that cost him about $45 after using the 20% coupon. That is a great price. Ken at Lonestar might be the largest rebuilder of Delco Moraine 4 piston calipers BUT......the original rebuilder who engineered and perfected the stainless steel re-sleeveing of Moraine calipers was George Jonas of Stainless Steel Brake Corporation.....they started doing so back in the 1970's. SSBC's quality is second to none! I have a set on a car that has been on for over 20 years not a drip....Lonestar....good to average quality in my book and they source their hardware overseas. I think there may not be a USA supplier of hardware left....but, SSBC would be the ones to consult with about that. Anyone need a set of Lonestar done calipers....give me a PM....I'll make them a great deal on a set of them new in the box. The best way to keep a corvette brake from leaking ,,,,,,,drive them . AND do maintenance on your fluid!!!! Many may dispute this....which is fine. But I can 'say' this without any regrets. I do not care who built the caliper...IF you stop and think about it...a caliper is really basic in design. When 'talking' about leaks. And as I wrote..I do not care if it is a lipped seal or O-ring seal. If the the brake system is neglected...there will be a problem. You can count on it. Because I have seen it. The stainless steel sleeve has a groove cut into it...and as I wrote...this pertains to BOTH seal designs. So having set of calipers on your Corvette and having no problems is all well and good...UNTIL...you go and install new pads and have to push the pistons back into the bore....is where the problem will show up....and the caliper can leak like crazy....but if you put your old pads back in as they came out...and NOT a drop of fluid will leak due to teh seal is against a good bore again. And so I do not get my head chopped off here....I am quite aware that there may be a few people who did just that...installed new pads and no leaks and they NEVER changed the fluid or serviced any part of their brake system. But I can 'say' that the law of probability are on my side where I can BET that some will leak....which will validate my comment. I do not see it as interesting...but rather what happens in how the system is designed. I guess we will have to wait and see. We will see if any agree with me...seeing how what I wrote does not satisfy your thirst for knowledge. Like I have anything to gain form what I wrote. It is simple...pushing back a seal on a worn, pitted, grooved inner sleeve ...with highly probable contamination CAN allow for leaks...but...if you need to hear it from other people...so be it. Why not contact the other members who do this type of work... who work on a lot more Corvettes yearly??? I apologize for seemingly again upsetting you for asking for extra information, that is what the forum is for and no offense meant. On the contrary I did find what you posted very interesting and thought provoking but again sorry that in My thirst for knowledge I like to hear back from more than one source, lots of people not just one, what's wrong with that? Do you have the list of people here who are in the corvette business? No, I will not go try to track down members who change their own pads and poll them but I will rather wait and see from replies how many people who changed pads experienced leaks. I get your need to be right and I didn't question that I believe you, you change a lot of pads and a lot leak, but you made it sound like most leak, did I misunderstand, so out of 100 calipers that you change pads on how many leak? so on the c3 you were getting local parts stores calipers? I replaced front calipers with NAPA remans (Delco) over the winter 2011-2012. This spring the right one started leaking. Took it back to NAPA and they had me a new one in about 2 hours. After a month it leaked. Took it back and 2 hours later picked up another and it has been fine. yes from a long island rebuilder that finally gave up and he returned my $. I think Dub is right. The last three I've replaced, was after pushing the Pistons all the way back into the cylinder. I guess the answer is to install a new caliper and pads, and never touch it again. If it's a good caliper, it'll last many years. But, some just aren't going to last. I'll replace them from now on from AA for $45 and hour and a half work. Too cheap and easy not to. First off ...you are not upsetting me by asking questions. AS I mentioned or maybe I did not....I know when I go to do brakes on a customers 1965-1982 Corvette I let my customer know what can happen due to the brake fluid in the master cylinder looks like coffee and has some thick sludge in the bottom of it...which means the valving in the master cylinder is all crappy and sludged up...which means the fluid going to the calipers is ALSO migrating this sludge to the sleeves and seals. Keeping a VIGILANT eye on you brake fluid and changing it can stop this...because IF the crap can not build up...then chances are it will not cause for a problem when the pads get changed out. BUT I have some customers who figure out the costs to maintain the system is not worth it and they will buy new part the next time the car needs pads. Last edited by DUB; 07-18-2016 at 05:59 PM. So are you saying most c3 owners neglect their brake system? I know, that's why I said some just aren't going to last. But, I'll just keep changing them out for $45 and a little time. Eventually I'll get the ones that will last. Therefore if I had any regular Calipers, I would be super trusting of them to do those also! I don't skimp on paying for quality related to brakes! My Father got a Lone Star Rebuilt caliper and it leaked immediately!!!! Maybe that was a rare occurrence, but it happened!